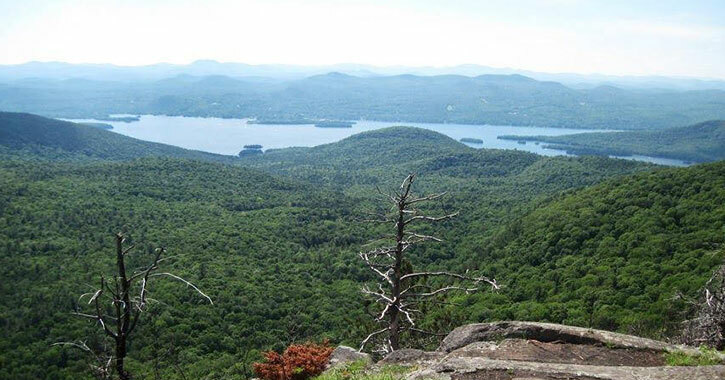 One of the best family-friendly hikes on the southeastern shoreline of Lake George is Sleeping Beauty Mountain. We've compiled some great tips, with photos, on how to reach the parking lot and trailhead, what to expect as you hike to the top, and where you can head in one direction to Bumps Pond and in another direction to the summit of Sleeping Beauty. Plan the route you are going to take to the trailhead and parking lot before you begin your trip. 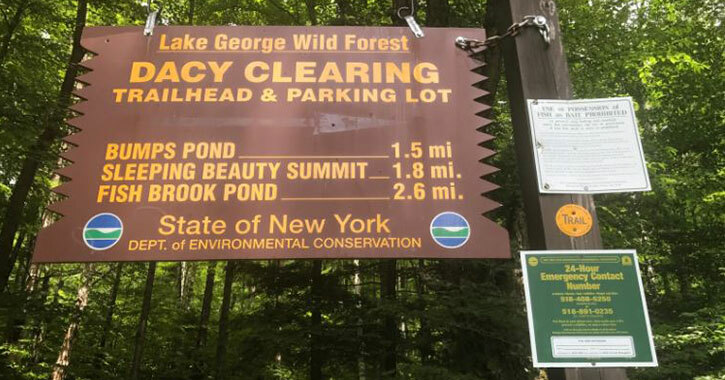 The most common starting point for hikers driving from Lake George, NY is to take State Route 9 south from Lake George Village to the intersection with State Route 149. From there, turn on to State Route 149 and drive east past the Queensbury Country Club until you arrive at the intersection with Buttermilk Falls Road and Patten Mill Road. Take Buttermilk Falls Road and drive north. Now, buckle up for a 3.2-mile drive along Buttermilk Falls Road until it becomes a dirt road named Sly Pond Road. Continue straight along this road as it becomes Shelving Rock Road. After you drive down Shelving Rock Road for a short distance, you’ll arrive at an intersection and see a sign for the Hog Town Trailhead parking lot. This is where your journey will begin. The Hog Town Trailhead features free parking where you can park your vehicle. If you decide to park and walk down the road at the back end of the parking area, you will add another 1.5 miles to your hike up Sleeping Beauty Mountain. 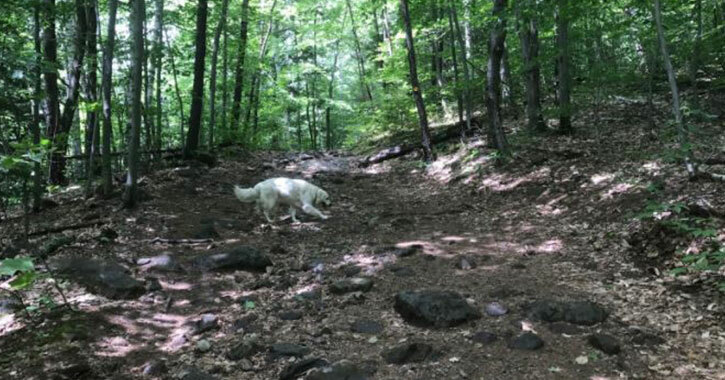 Luckily for hikers, and especially families, the 1.5-mile dirt road from the Hog Town Trailhead to the Dacy Clearing Trailhead (main trailhead for Sleeping Beauty Mountain) is open for vehicles seasonally, typically in summer and during periods of dry weather. 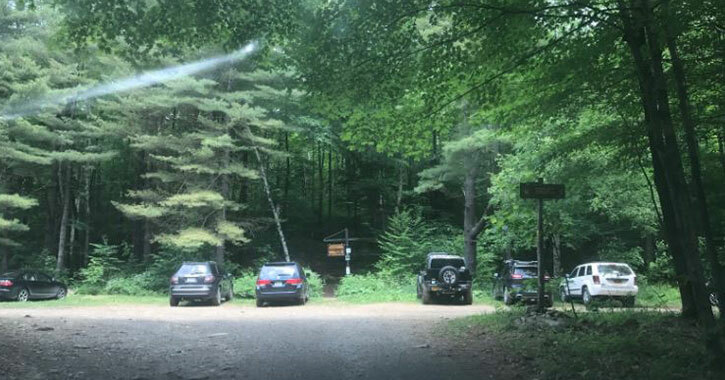 You can drive down this road to the Dacy Clearing Trailhead and parking area, but it’s important to note that it is single-lane with many bumps and dips, so be sure your vehicle can handle the journey. After you’ve traveled down this dirt road, you’ll arrive at the Dacy Clearing Trailhead and officially begin your trek up the mountain. 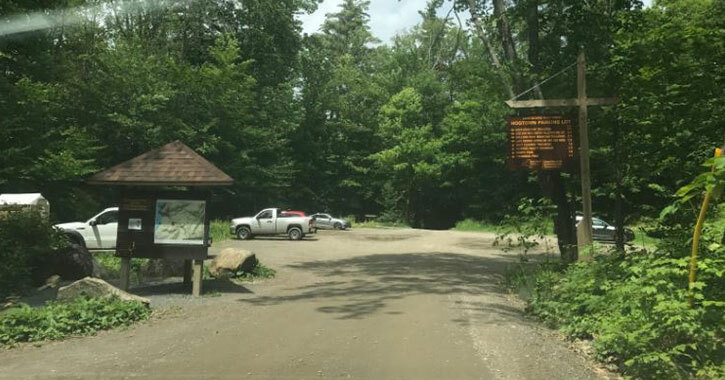 Be sure to sign in at the trailhead and note the 24-hour emergency contact number for the Sleeping Beauty Mountain/Bumps Pond/Fish Brook Pond area, which is 518-480-6250. 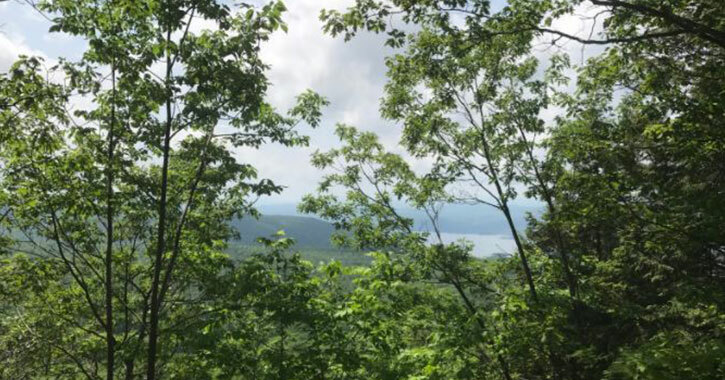 This Lake George Region peak has a well-marked trail with varied terrain that includes slightly inclined sections and rocky paths up the mountain. Watch your step during the steeper parts of the trail, especially when hiking with little ones. If you follow the trail markers and signs directly to the summit, the hike should be about 1.8 miles one way. Alternatively, you can extend your hike by following the foot trail markers and intersection sign to nearby Bumps Pond, a scenic pond in a quiet wilderness setting. When you arrive at the intersection, it might be a little confusing which direction takes you where, as the two yellow arrows pointing in both directions are not well marked. 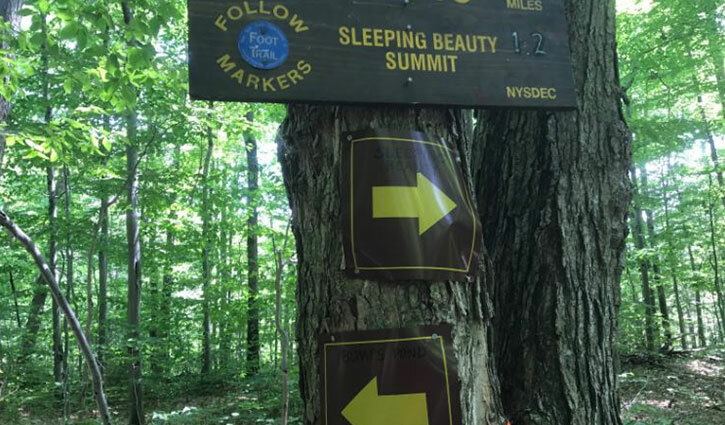 The bottom arrow pointing left will take you to Bumps Pond, while you'll want to keep right to stay on the trail to Sleeping Beauty. 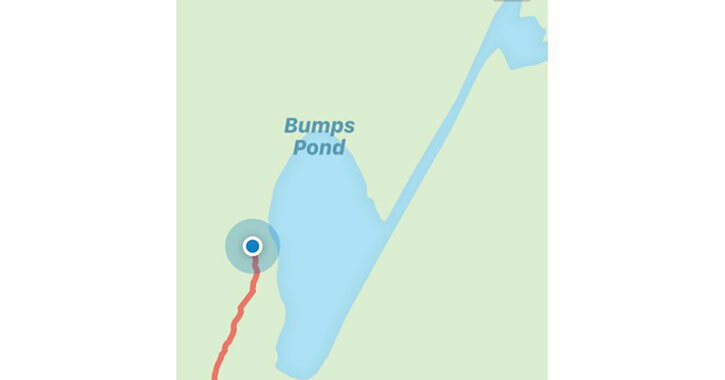 If you decide to hike to Bumps Pond, then that hike will be 1.5 miles one way. Families and beginning hikers might want to hike to the pond one day and to the summit of Sleeping Beauty another, while more experienced hikers combine them. Once you arrive at the pond and check out the sights, you can then continue up the mountain for a breathtaking view of Lake George from the top. As you get closer to the summit, you'll notice some scenic viewpoints that will give you glimpses of the lake. There is plenty of space on the rocky summit for photos and to take a short breather before you begin your descent. Ready to tackle some more hikes? Head back to the Lake George Hiking Guide. Want to try some new adventures? See everything there is to do in Lake George.